It was only a couple of years ago that the Pacific Wren was split off from the more easterly Winter Wren. I've seen both in their ranges, but don't consider myself any sort of expert on the differences between the two. David Sibley did a couple of nice presentations on them: Distinguishing Pacific and Winter Wrens and New Draft Range Maps for Winter (& Pacific) Wrens. I kinda like the name "winter" as this is a species I've only seen in December and January. I suppose the name "Pacific Wren" is okay, but I'd not be opposed to changing it to "Western Winter Wren" though that might disgruntle those on the Pacific coast that see them year round. 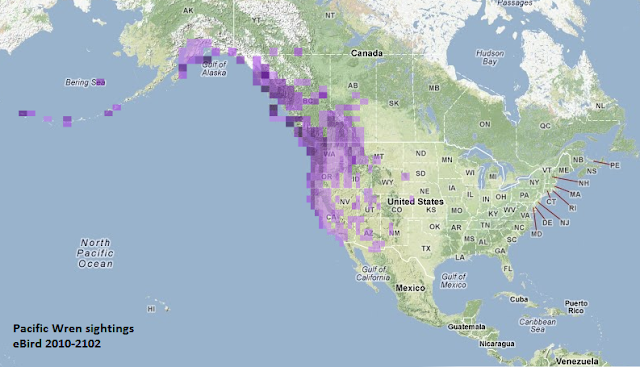 See the eBird sightings map below. The little Pacific Wren shown here was only the fourth one I've ever identified and recorded. I've seen one each year for the last four years. On this crisp December Saturday morning, we took a group of 11-year old Boy Scouts to the MK Nature Center in Boise to work on the achievement of identifying 10 animals and 10 plants. We far surpassed the requirements just in the parking lot. We ended the hour with 22 bird species and loads of cool mammal and fish sightings as well. Images digiscoped with a hand-held iPhone 4S through a Swarovski ATX spotting scope. Nice work Robert, and great shots too! Those Wrens and be trouble. Sounds like a fun excursion for the Boy Scouts. Cute wrens! Great shots... thinking I need a new phone instead of new camera. WOW! You may be aware that it was actually a three way split. The Common Wren in Europe and Asia was also elevated to full species at the same time. Interestingly enough that is the only wren to regularly occur in Europe. I was able to see a couple when I was in Sweden last year so I have managed to see all three species of the former Winter Wren. It’s not just folks on the coast. I also thought Winter Wren was an odd name for a bird that is far more common in the summer. When I was at Craters of the Moon I only saw Pacifics in the summer. But then I think siskins, juncos and waxwings are summer birds too.